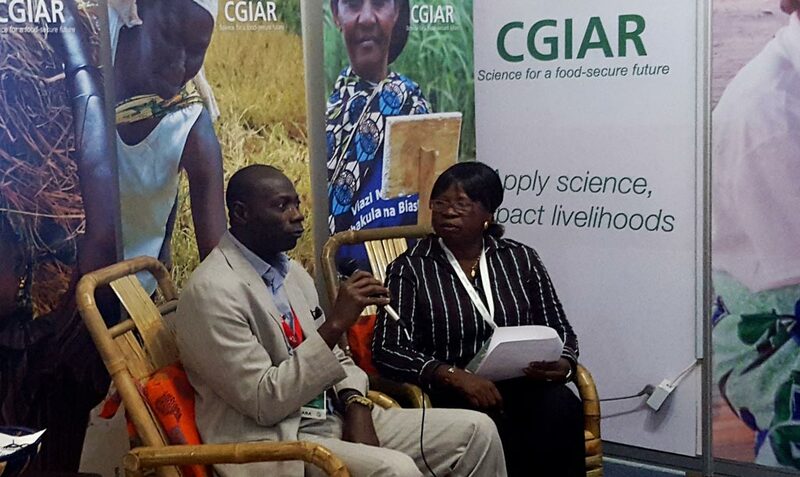 In consonance with the theme of this year’s FARA event, Apply Science, Impact livelihoods, the SARD-SC project, funded by the African Development Bank (AfDB) held a side event on the topic, SARD-SC contributing to food and nutrition security in Africa. SARD-SC officials highlight the achievements of the project in its four mandate crops. The purpose of the side event was to highlight the achievements of the project in its four mandate crops―maize, rice, cassava, and wheat, and to show how the development of their value chains is contributing to food and nutrition security in Africa and improving livelihoods. In attendance were participants of the FARA event including Nteranya Sanginga, Director General, IITA; and Chiji Ojukwu, Director of Agriculture, AfDB; and other key personalities. SARD-SC Communication Officer Interviewing a guest. Chrys Akem, the Project Coordinator, gave a brief overview of achievements and outcomes of the project such as new crop varieties developed, establishment of processing centers, capacity development, engagement of women in all aspects of crop value chain, and commercial banks getting involved in the maize commodity value chain activities. More importantly, he said, the achievements of the project have engendered shifts in some countries’ agricultural policies in Africa. Each of the commodity specialists made presentations on achievements of the commodities. Marie Yomeni, Cassava Commodity Specialist, talked about the benefits of innovation platforms (IPs) in fostering strategic alliances within the IPs, provision of improved quality of planting materials to farmers, reduction in postharvest losses, and mushroom production using cassava waste. The other three Commodity Specialists, Sam Ajala, Sidi Sanyang, and Solomon Assefa also presented the achievements on their respective crops. The project showcased technological innovations, products, and achievements of the four commodity value chains during the two-day exhibition at the FARA event.